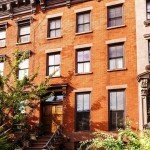 Cambridge Place is a short and charming block of Clinton Hill, Brooklyn—the type of leafy, brownstone-lined street that has made the borough so popular. 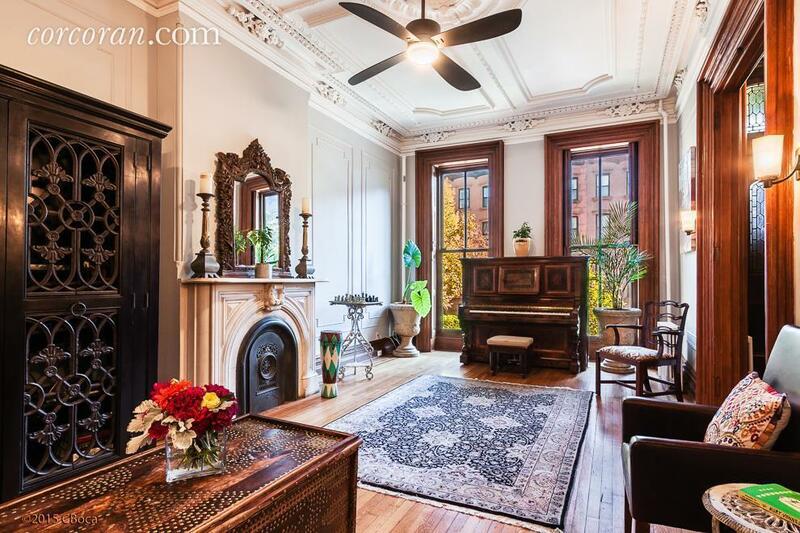 And once you’re inside this townhouse at 14 Cambridge Place you’re still living the Brooklyn dream. 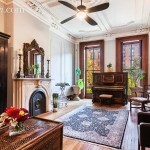 There are historic details everywhere, like fireplaces, coffered ceilings and elegant wood-framed doorways. 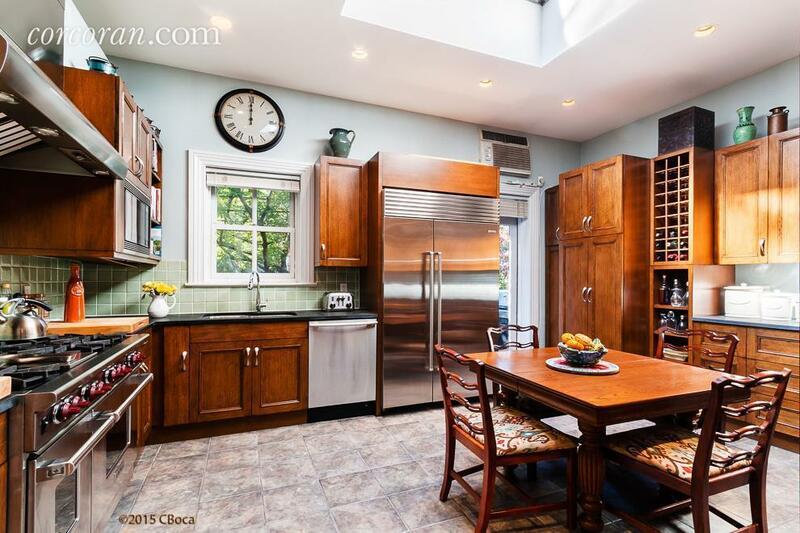 There’s tons of space, more than one outdoor area, and a fancy kitchen. 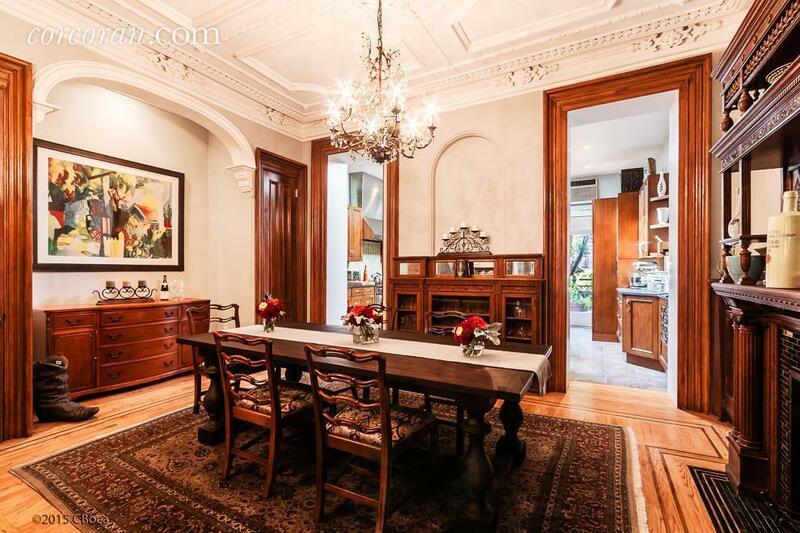 This house has got the goods, but it’s going to cost you $3,999,999 to own it. 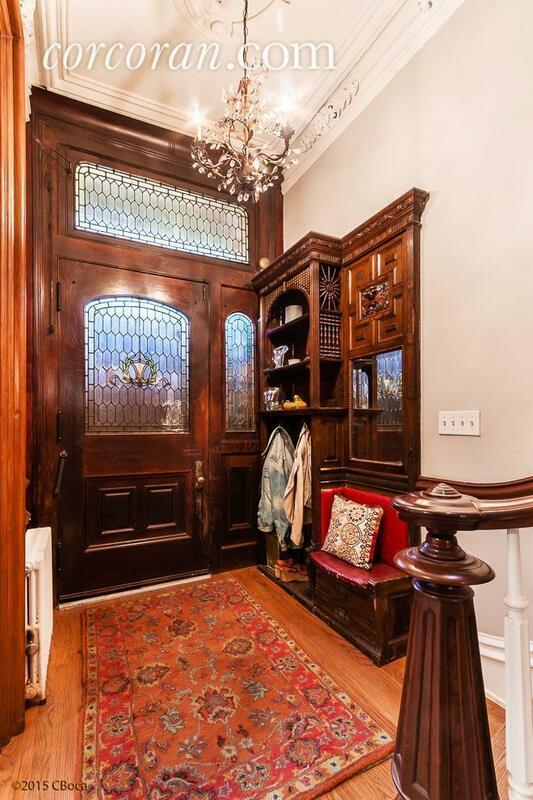 This house is impressive once you open the door. 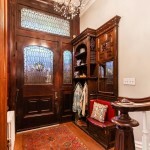 It has its original mahogany door, which is accented by leaded stained glass. 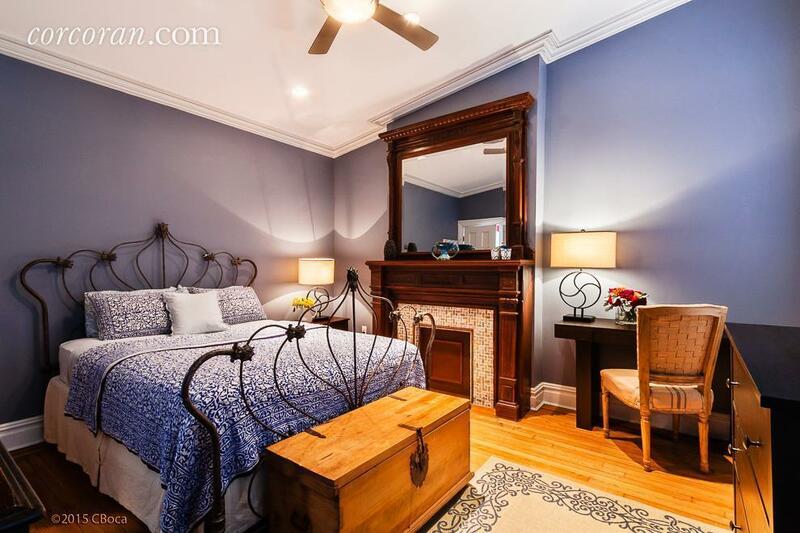 There’s also a wood-carved mirror, coat rack and tiny seating area directly to your left. Talk about craftsmanship! The parlor floor has a living room in front, dining room in middle, and eat-in kitchen in the back. 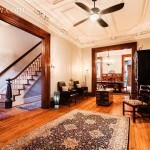 This level is decked out with ceiling plasterwork, woodwork, decorative fireplaces, the works. 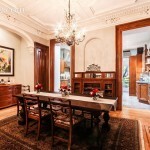 The dining room has some particularly nice original features: a mahogany built-in china cabinet and an elaborative carved decorative fireplace with shelving and woodwork. That’s topped off by more ceiling details above. 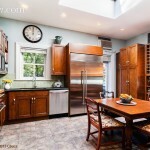 The kitchen is totally modernized, with oak cabinetry, bluestone countertops, a six-burner Wolf stove and a SubZero fridge. A glass door from here leads out to a paved backyard space. Upstairs there are a total of six bedrooms. 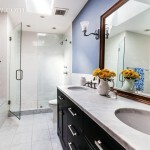 (There are also two studio apartments that the current owner rents out on the garden-level floor.) 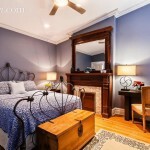 Pictured above is the guest bedroom, which has yet another decorative fireplace — this one accented with marble — and a walk-in closet. 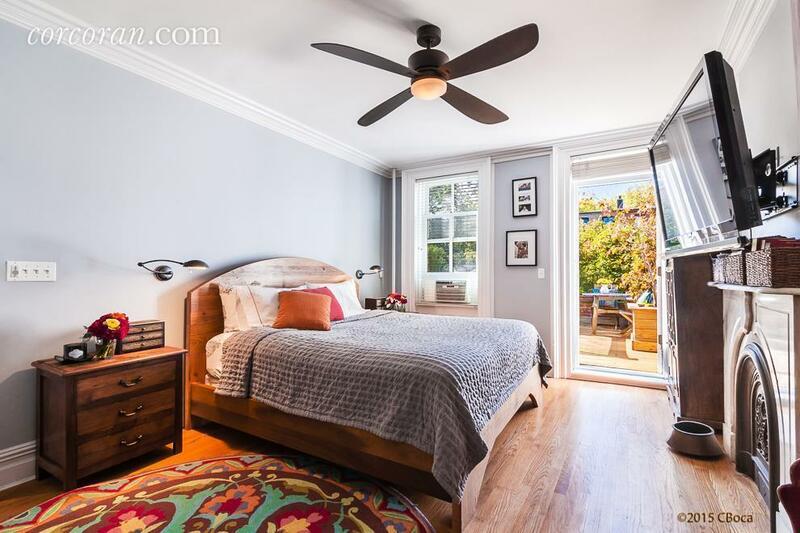 The master bedroom looks beautiful and bright, with a little less of the ornamental detailing. There is still, of course, a decorative fireplace in here. A big window and doorway, which lead out to the bedroom’s private patio, gives the space a more airy, modern feel. The listing suggests that such a deck is perfect for “a late night glass of wine or your morning coffee.” Sounds good to us. 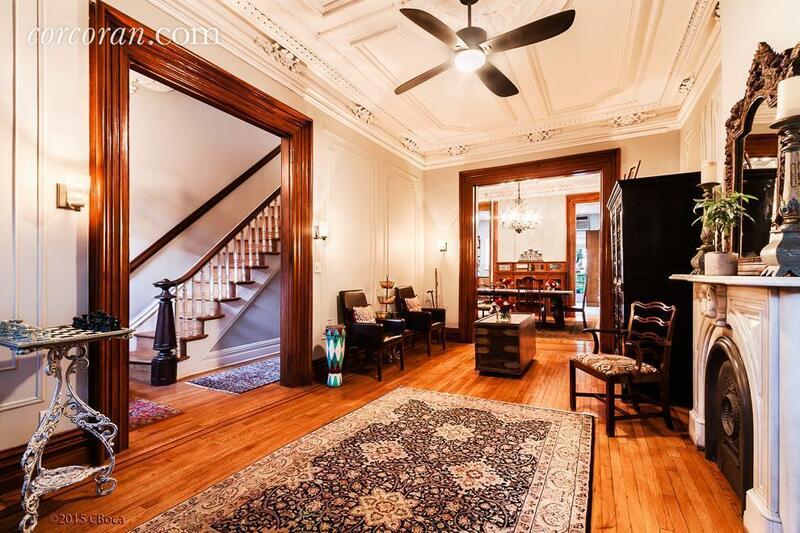 We’ve gotta ask…does the Brooklyn townhouse life get much better than that?